The British Library has digitized and made available for ipad various handwritten notebooks from their collection - William Blake, Lewis Carroll, Leonardo da Vinci, Jane Austen and Gerardus Mercator . 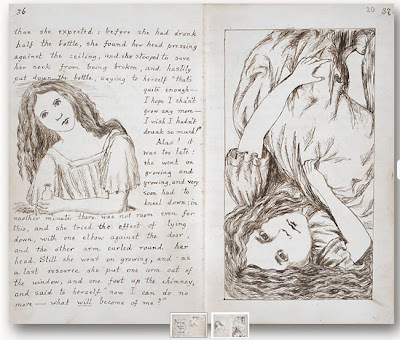 For a limited time Alice's Adventures Underground - Lewis Carroll's notebook is available free! From the BL website: "This small notebook, which came into Blake’s possession in 1787 following his brother’s death, was used by Blake for over thirty years to record sketches and to work on drafts of his poems. 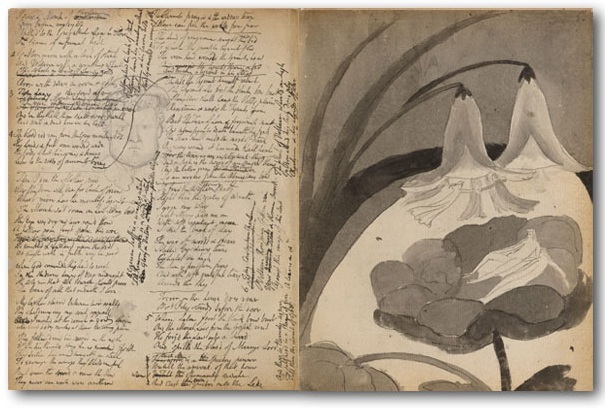 The dense, closely-filled pages provide a fascinating insight into Blake’s compositional process, and allow us to follow, line by line, correction by correction, the genesis of some of his best-known work, including poems such as ‘London’ and ‘The Tyger' This eBookTreasures version contains the complete manuscript along with commentary on selected pages." "Later known as Alice in Wonderland, this is the original manuscript given by Lewis Carroll to Alice Liddell for Christmas 1864. One summer’s day in 1862, he took Alice and her sisters on a boat trip on the Thames by Oxford, where he taught as a mathematician. Along the way he entertained them with a fabulous story of Alice’s adventures in a magical world entered through a rabbit hole. Ten year-old Alice begged him to write it down, and eventually he did, giving her this meticulous manuscript of the tale for Christmas. This eBookTreasures version has transcription throughout as well as superb narration by Miriam Margoyles."